Unedited SHE medicine direct from me + SHE It seems only right that as the moon begins to wane, the SASSY SHE Oracle Cards are calling us into DARKNESS. For some, the darkness is a place that we've been told to be scared of, it can be where our deepest fears reside and is usually a place we avoid at all costs, but just like the day needs night, we need to experience the darkness in order to fully grow. Daring to FEEL into the darkness, which is what you're being invited to do this week, is an opportunity to do the Work, to become the spark that stokes the fire, that becomes the light for yourself AND for those around you. 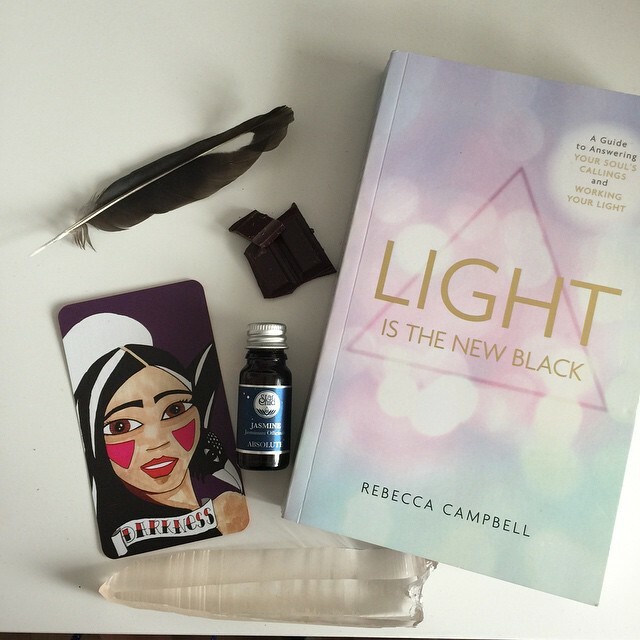 To guide you on your SHE Quest this week: - The brand-new book Light Is The New Black by my soul + spirit sister, Rebecca Campbell - let this book be a torch in your darkness. Cacao - a beautiful way to provide your soul with nourishment as you navigate the darkness. Jasmine - a sensual scent to bring you IN to your body so you can truly FEEL Magpie medicine - to help uncover hidden truths Lemurian Seed Crystal - a light messenger of the most magical kind.